It starts badly, when I realise I’ve defrosted a socking lump of venison, rather than the beef stewing steak I’d intended to. Venison in our house is for treats; birthdays, friends for dinner…Friday-nights-with-a-bottle-of-wine at least. It’s not for hurried stuff-it-down Tuesdays, when the children have theatre class and Stephen has poker. But here it is. Twenty minutes before the school bus (and the flight to the Spiceball), I am searing my (Oh God! Loin!) and praying that pot-roasting at 150 won’t be too awful. I am slicing a Spanish onion as fast as I can, with my last two cloves of fat, local garlic. I have no other veg other than the Value carrots bought for the pony, but I peel them and chop them, and in they go, along with the last few shrunken mushrooms and a snatched handful of rosemary. So far, so typical of a Tuesday – using odds and ends before the shopping arrives tomorrow. I’ve no bones to chuck in the pot, so I add a frozen brick of beef stock, and I whiz to the drinks cabinet to grab the port. No port. Seven minutes until the bus. And I’m under the stairs, rifling Stephen’s red wine, wondering exactly how cross he’ll be if I pinch a 2011 Tempranillo. The ones with the red label, that he was so chuffed to find. My nerve fails me, and I tear back to the drinks cabinet. Vodka, gin…Galliano. No, no. Chartreuse? Why why why did you drink the bloody port? I’m about to grab the Vermouth (as always), when I see something the Pees bought us back from one of their French forays. 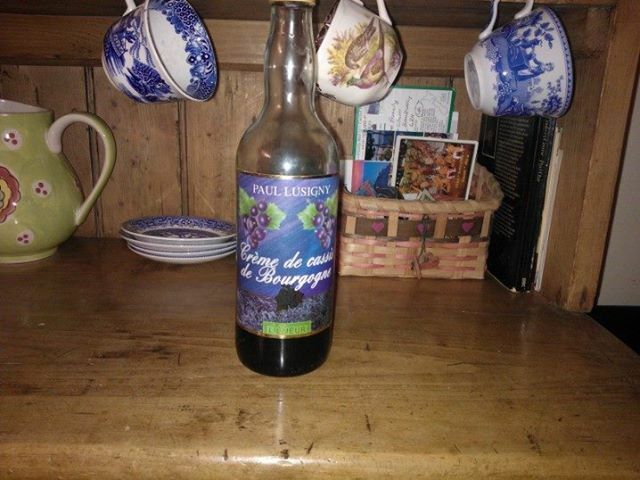 ‘Creme de cassis de Bourgogne’. Perfect for poshing up cheap fizz. It has a pretty blue label featuring glossy black currants. Which are almost like blackberries. And blackberries and venison might work. I’m back in the kitchen and I’m sloshing it in, then the whole thing’s boiling and smelling promising, and it’s in the oven and I’m off, out the door and up the road, cheeks pink, mind racing, onto the next thing, and the next. We sit down to eat past six. The children are tired and stroppy; Stephen’s white with exhaustion beneath the soot. I’ve totally forgotten how I made dinner (was it really only three or so hours ago? ), although it smells good – outside it’s raining, inside there’s pot-roast. El prods suspiciously at her sausages (Not eating Bambi, Mummy) and I bustle, serving the rice (sadly no potatoes) and the inevitable petite pois. I’m the first to begin. The sauce is a lovely colour – very rich and glossy. I remember I forgot to check the seasonong, but hey-ho. Oh God. I freeze, fork mid-air. It’s terrible; sweet, syrupy, fruity. As revolting as if I’d cooked it in Ribena. I whimper. Stephen takes a forkful, and looks confused. He takes another, then looks at me nervously (I’m sensitive about my cooking). I groan, and the children guess something’s up. They both taste some, and crow with delight. ‘What happened?’ says Stephen. ‘It looked so nice.’ He gazes into the casserole dish, as if I’d tricked him, and that’s not what it tastes like at all. I drop my head onto my arms, thinking of the quarter of cream in the fridge. Of course that would’ve worked. And we have no less than four bottles of brandy. I’m gutted. Jess and Stephen manage to eat quite a bit, helped by ketchup and Parmesan. ‘Yes,’ says Stephen, after a while. ‘At least it’s not as bad as the chocolate chilli – do you remember? With all the cinnamon and…’ he catches my eye. And grins.